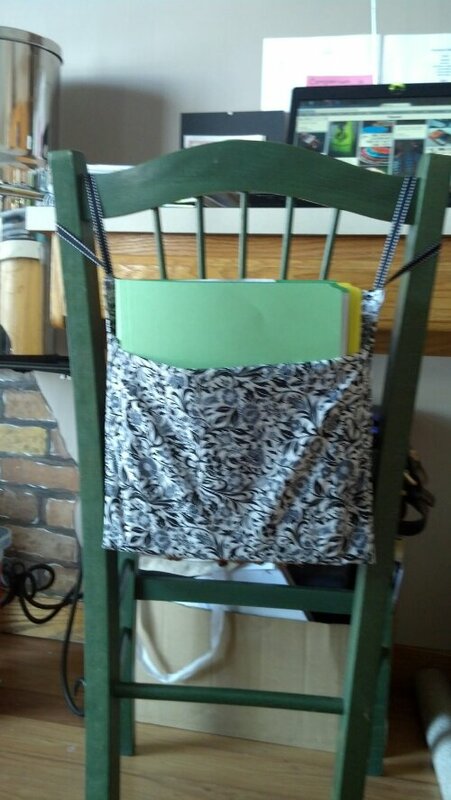 Last year, in an effort to cram something in my “sewing” skill goal, I created a seat sack. I found the idea on Pinterest. It looked easy enough. After a few attempts and considerable frustration, the “seat sack” was finished and quickly downgraded to a plastic grocery sack holder. Sadly, it was not even sturdy enough to remain in that role for very long. This year, I am determined to add sewing (at least basic sewing) to my list of skills. Yesterday, my grandma took a look at my handiwork to see where it had all gone wrong. We looked at the seams and I showed her the tutorial for the seat sack. She helped me re-do it so that it is sturdy and useful. It took awhile because every time I would sit at the machine to follow Grandma’s instructions, the thread would tangle in the machine or the perfect seam I was sewing would suddenly become a ridiculous curve on the fabric. Obviously, the sewing machine did not like me. Eventually, it was finished, and while not perfect, it is sturdy enough to hold file folders and other papers…keeping the desk area (somewhat) cleared. After finishing the project I discovered a few things about myself. 1. I can’t sew a straight line. 2. I am impatient with things I do not fully understand. 3. I am intimidated by inanimate objects. Fortunately, all three of these hurdles can be overcome through practice, patience and sewing lessons from Grandma. I have plenty of scrap fabric to practice my stitching on, and I hope to master (or at least get better at) threading the bobbin and sewing a seam. But, getting comfortable and familiar with my machine is my top priority. This entry was posted in 13 Skills, Sewing. Bookmark the permalink.